An appropriate title for this week’s chapter of the Flash Gordon rewatch – it’s flaming hot here in Vancouver at the moment with no sign of the heat letting up. At the end of last week’s chapter, Dale was being chased around by the King of the hawkmen and professional cackler, Prince Vultan. Flash, Zarkov, Princess Aura and Prince Baron were plummeting to their deaths in Prince Baron’s rocketship. Baron’s Rocketship is stopped by the gravity defying rays that support the sky city but our heroes are now King Vultan’s prisoners. Prince Baron, being a bit of a pessimist, seems to think this is a really bad development. It turns out to be good for Dale though because King Vultan is interrupted in his harassment of her by the arrival of the prisoners in his throne room. Power couple, Flash and Dale are reunited. Zarkov gets shipped off to another laboratory and Flash and Prince Baron are sent to the furnace room. Vultan finds everything very funny. Again. Unimpressed with the capture of his daughter, Ming launches his rocket fleet and sets off to teach Vultan a lesson. Flash and Prince Baron arrive in the furnace room and rejoin Prince Thun. Flash isn’t happy about the way his friend is being treated and does what he does best – he starts a fight. He is quickly subdued. Zarkov is tasked by Vultan to discover a new force that can be used to support the sky city. Until he does, Flash and the others will be forced to shovel radioactive ore into the furnace with predictably dire consequences. Princess Aura is up to her devious ways again and tells Dale that the only way to save Flash is to convince Vultan she loves him. 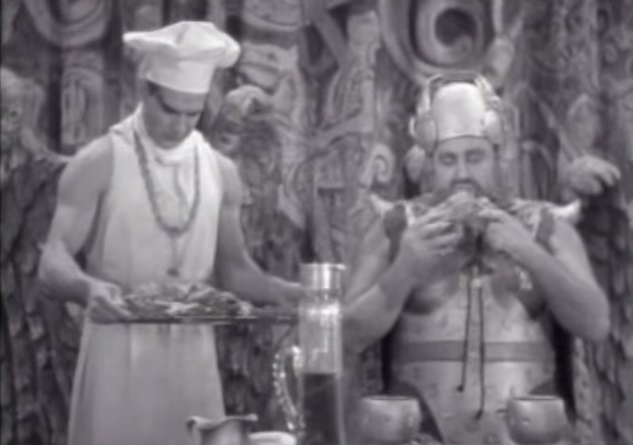 Dale selflessly agrees and returns to the gluttonous King Vultan. 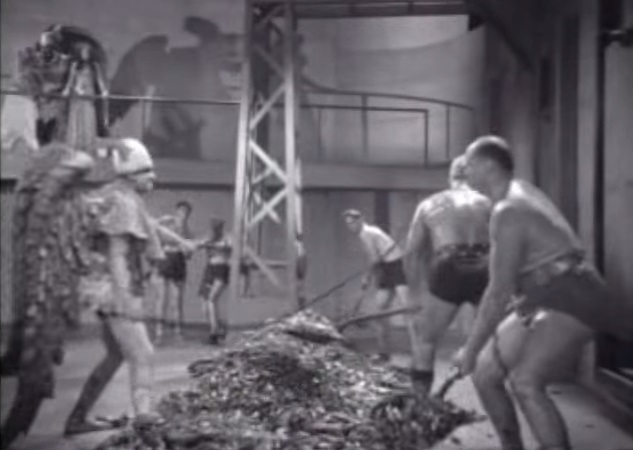 While Dale puts up with King Vultan’s advances, Flash, Baron and Thun get very sweaty shovelling radioactive ore. One of their co-workers collapses and they see an opportunity to escape. They lead a mutiny but Vultan’s armed guards make empty threats to kill everyone and Flash is sent back to work. Dale sees Flash being beaten and faints. Again. Flash’s heart is apparently not up to the job of working in the furnace room but his feisty attitude earns him a trip to the static room. Aura berates Dale for being a coward and in an attempt to redeem herself, Dale tries to convince King Vultan that she was overcome by the heat in the furnace room and that she no longer loves Flash. In an attempt to “know the truth”, Vultan takes Dale to see Flash being tortured in the static room. Dale attempts to hide her feelings, but it’s all too much for her and she goes all Edvard Munch. Flash is overcome by the sparklers in Vultan’s static room and passes out. What will Vultan do with Dale now it’s clear she still has feelings for the earth man known as Flash Gordon? Where has Princess Aura sneaked off to this time? I wonder what Jean Rogers thought of her character’s inability to stay on her feet faced with any kind of adversity. Aura is great though, and look at those eyebrows – Amanda Palmer would be proud. A bit of a cheat this week but it’s my blog and I’ll cheat if I want to. During the scene where Aura convinces Dale to profess her love for Vultan, I accidentally hit the short cut to turn on YouTube’s automatically generated subtitles. The results were unexpectedly hilarious. Favourite character goes to Charles McMurphy‘s portrayal of a the furnace slave driver. Sterling work, even if he did drop the whip at one point. And an honourable mention to the server in King Vultan’s court for his subservient demeanour . That brings us to the half way point of the series, and it finally hit me this week how passive Flash is so far. Sure, he starts fights, sometimes he even finishes them but it’s the bad guys who are driving all the action so far. Not very heroic. Find out how Flash escapes King Vultan’s sparklers in next week’s chapter – The Shattering Doom. Time is running out to get a FREE copy of my homage to serials like Flash Gordon – a science fiction novel called Glitch Mitchell and the Unseen Planet. 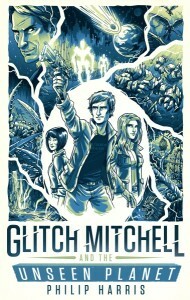 I’ll be giving everyone on my mailing list the book for in a couple of weeks. If you’d like a copy, just sign up here – I’ll give you FOUR of my other ebooks right now, as a thank you. 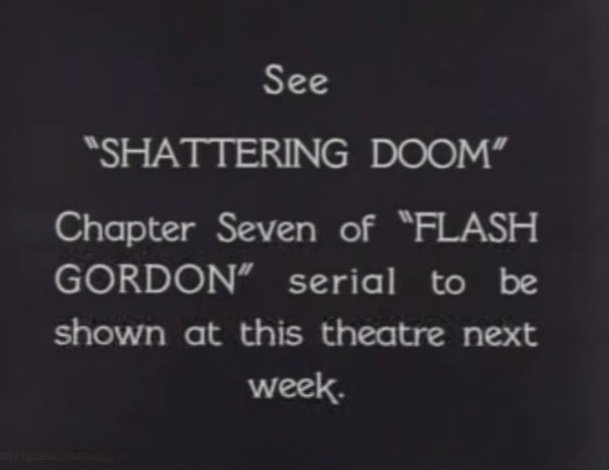 The cliffhanger ending to Chapter 6 is one of the best in this Flash Gordon serial. As to Princess Aura, you cannot help but admire how she will do almost anything to get the man she loves. She is my second favorite character in this serial, next to Dale Arden. My favorite scene in this chapter is when Princess Aura really gives Dale a tongue lashing and tells Dale that she is the source of all Flash’s troubles.